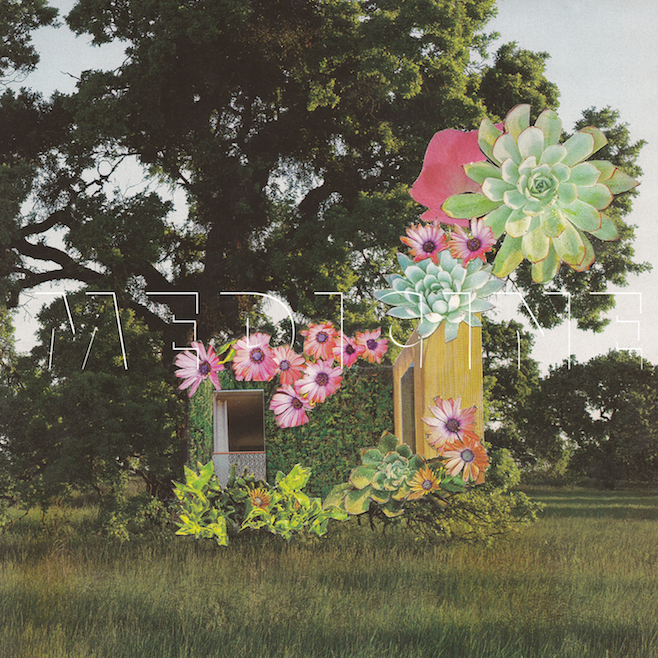 After many years in the wilderness Los Angeles' Medicine triumphantly returned with 2013's To The Happy Few, a complex treat overladen with guitar-effects, sudden tempo and style changes and tone bends which worked more often than not. With their new album Home Everywhere, Medicine continue in the same convoluted, over-the-top manner as their predecessor. However, the cohesion that glued the songs together and the ideas that brimmed and flowed effortlessly seem strangely absent for most of the album, leaving a dispirited mess of a record that, while it has its moments, could have done with some refinement and quality control. 'The Reclaimed Girl' opens to background field recordings and dripping water, before launching into a full on cacophony, sharing an ethos with early Mercury Rev bonkers-ness. Beth's distorted vocal sounds like it's been sung underwater, backed by flailing, distorted guitars and attention-grabbing samples which pop in and out like often unwelcome guests. While it is certainly a confident start and is immediate, it shares some of the excesses of Of Montreal and represents the muddle that clouds a great deal of this album. 'Turning', while increasing the distortion in the electronics and urgency in the drums, possessing a sort-of recognisable and memorable chorus, shares the chaotic nature of the opener. Again the song sounds busy and over-filled, with melodies and vocals buried deep, struggling to emerge over the suffocating production. Even where there are apparent lurches from the template, the tendency to over-complicate hinders the promise in a number of songs. 'Move Along Down the Road' contains a rawer, riff-tastic guitar and drums pushed back into the mix, but again suffers from a default of indulgence, with the song wandering off into uninteresting tangents. 'Cold Life', with Brad on lead vocal, feels poppier and more upbeat and possesses a nice, oriental-tinged guitar that makes a brief appearance, but the drummer seems to be playing along to a different, almost glam rock song. Listening to it makes you feel seasick. 'They Will Not Die', while a little more restrained with a mantric close, still feels like a patchwork quilt of parts that don't quite fit together. Thankfully, the album has its moments, almost uniformly where much needed restraint is exercised. 'Don't Be Slow' is immediately more rhythmic. A 65daysofstatic-shrilled guitar opening leads into a playful number, with reflective, uncluttered melodies that try to poke their way in. Electronic squelches, bass, and guitars appear but add substance rather than overwhelm the song. It has strong nods to psychedelia but trims back the stop/start excesses a little. 'The People' also allows the individual instrumentation and vocals to remain unswamped by the samples and distortion, with the song taking an interesting turn by stopping halfway through, leaving just field recordings and buried woodwind to close the track. 'It's All About You', thankfully not a re-interpretation of the McFly cringe-fest, is a surprisingly sparse song, allowing piano and drums to lead and support Beth's largely undistorted vocal. The line “Relax and let me in” couldn't be more apt. Even when the volume increases and the inevitable shards of guitar appear, they compliment rather than drown the song. If only the band visited this path more often. Pushing 11 minutes, 'Home Everywhere' could have failed badly as it struggles to find a hook it can stick to and retains the deeply treated vocal as a default, but there is more groove. The melody, the warbles of synths and samples, and barely-audible piano add to the strengths of the track. Feeling more danceable in places, especially when Beth's hypnotic vocal pops through and with nods to Yo La Tengo in the squally guitars, the song is a strong closer, though it is still dwarfed by the truly magnificent 'Daylight', the final track on To the Happy Few. Unlike most bands that reunite after some time away and simply look backwards by solely re-visiting their back-catalogue, Medicine have pushed on and tried to commit their ever-evolving ideas onto record. It's such a pity, though, that they couldn't build on the momentum of To the Happy Few. Home Everywhere is straight-jacketed by cramming too many sounds and notes into as much space as possible, while often forgetting the hooks, to the point that many songs suffer from lack of memorability. Despite this, it's always good, if somewhat frustrating, to hear a new Medicine release. This is an album that will improve with each listen, if you have the patience to keep persevering.